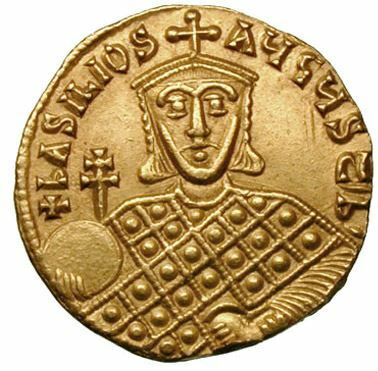 Basil I was a Byzantine Emperor who reigned from 867 to 886. Born a simple peasant in the theme of Macedonia, he rose in the Imperial court, and usurped the Imperial throne from Emperor Michael III. Despite his humble origins, Basil showed great ability in running the affairs of state, leading to a revival of Imperial power and a renaissance of Byzantine art. It is remarkable that Basil I became an effective and respected monarch, ruling for 19 years, despite being a man with no formal education and little military or administrative experience. Moreover, he had been the boon companion of a debauched monarch and had achieved power through a series of calculated murders. Basil's spirits declined in 879, when his eldest and favorite son Constantine died. He now raised his youngest son, Alexander, to the rank of co-emperor, as he disliked his other surviving son, the bookish Leo. He probably suspected Leo of being the son of Michael III, suspected that he might wish to avenge the murder of Michael III. Nevertheless, he was succeeded by Leo after his death in a hunting accident in 886.